The Insurance Analysis report is an Advanced Report which displays the number of encounters by insurance class in a specific date range where a payment was applied. Table - The top of the results for the Insurance Analysis report are a table with the following headers: Insurance Class, Number of Accounts, Charges, Primary Insurance Payments, Other Insurance Payments, Patient Responsibility amount, Adjustments, Balance Due and the percentage of all charges in the system. Beneath the table is a grand total line which totals all of the above. Graph - Beneath the table results is a bar graph. 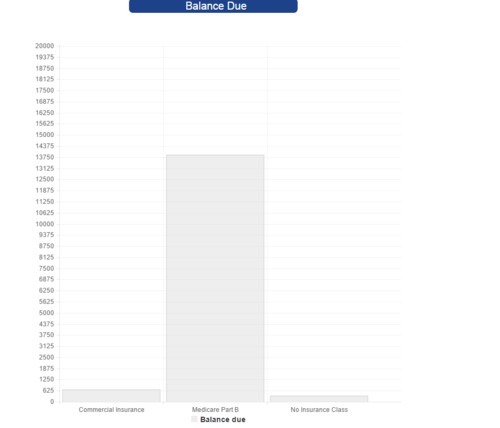 The graph shows the total balance due per insurance type class. The X axis is the insurance name. The Y axis is the balance due.